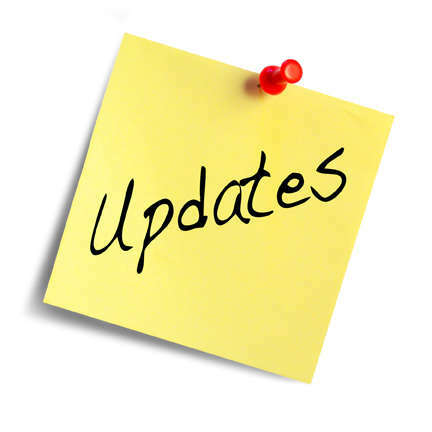 We are always busy discipling students or raising leaders through our different training tracks, which is the core of what we do. 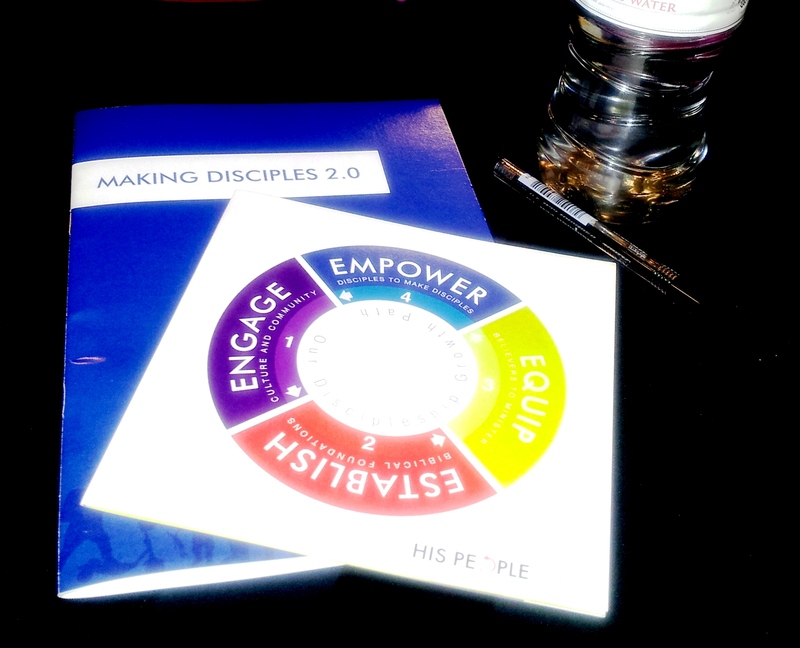 My highlights were the leadership festival with our area leaders (it was wonderful to learn together and to have our key leaders grasp more of the ‘nuts and bolts’ of the mission of discipling nations). “Women of the Word” was another one of my highlights, because of the relationships formed and the opportunity to watch God at work as older ‘girls’ teach the younger women. 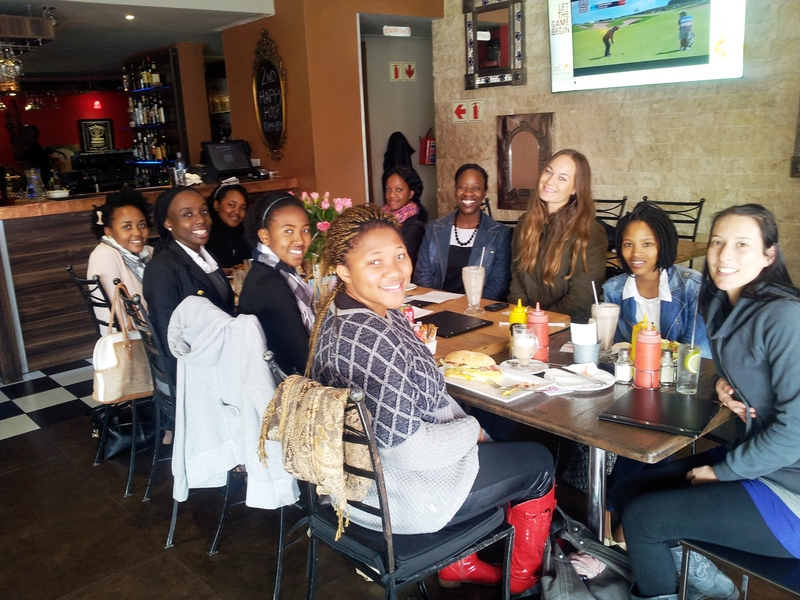 Some of the ‘Women of the Word’ group having our celebratory lunch together. 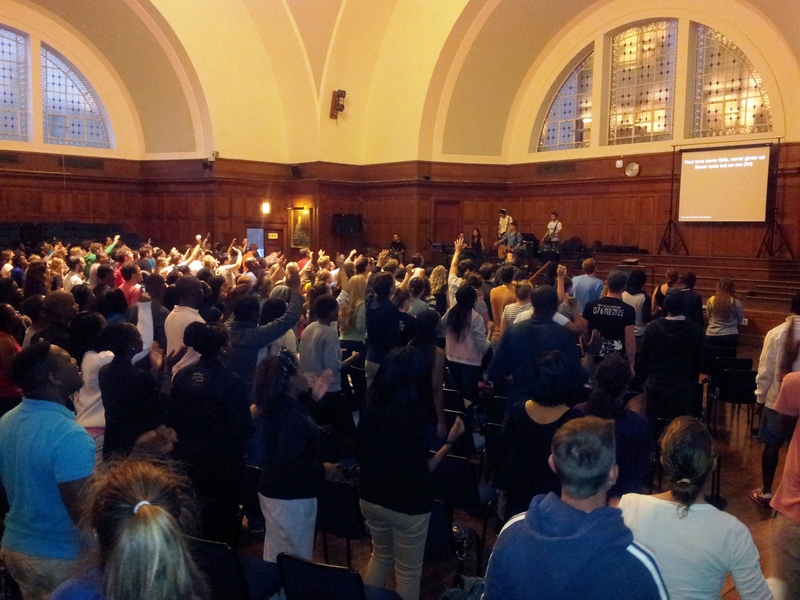 This year, Campus Harvest Cape Town was at the Tygerberg campus. 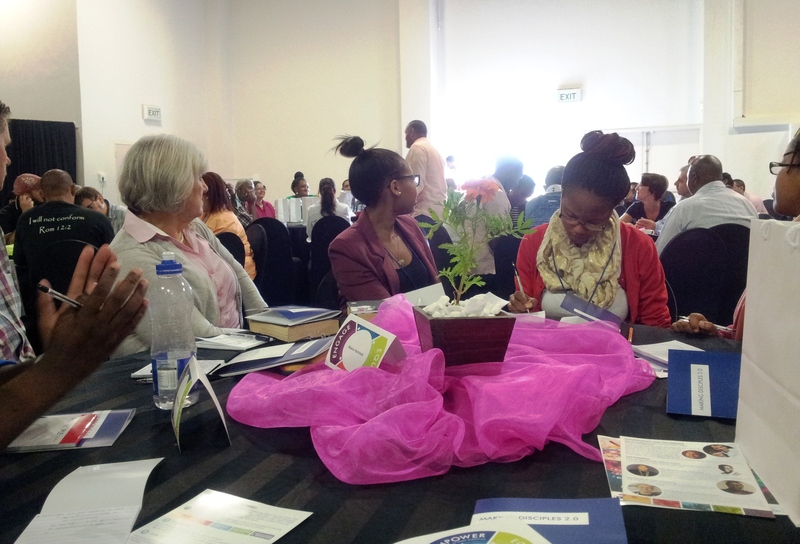 It was a God encounter day, filled with inspiration, training, fun and action! In the afternoon we went to reach out to the students who live on the campus in love, prayer, and of course with the gospel. We really saw our students go out not only ‘unashamed’ of the gospel, but also full of faith in God’s power to save, heal and restore lives. One of the best parts for me was to see the next tier of student leaders in action as our ‘Ministry Leaders’ from each campus hosted the day. 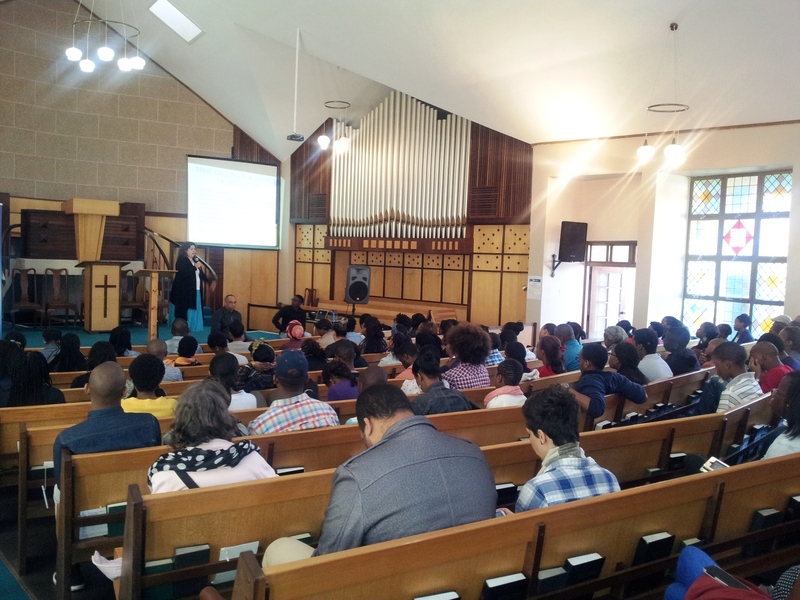 In April we had our first “Leaders in Transformation” (LIT) workshop at Baxter in the midst of a three-week series at our Sunday services, called ‘Make your Mark’. It really was an important moment for us. We had about 150 students and young professionals come and it proved to provide what we have been looking for – to equip student leaders to impact all spheres of society through transforming their vocations. 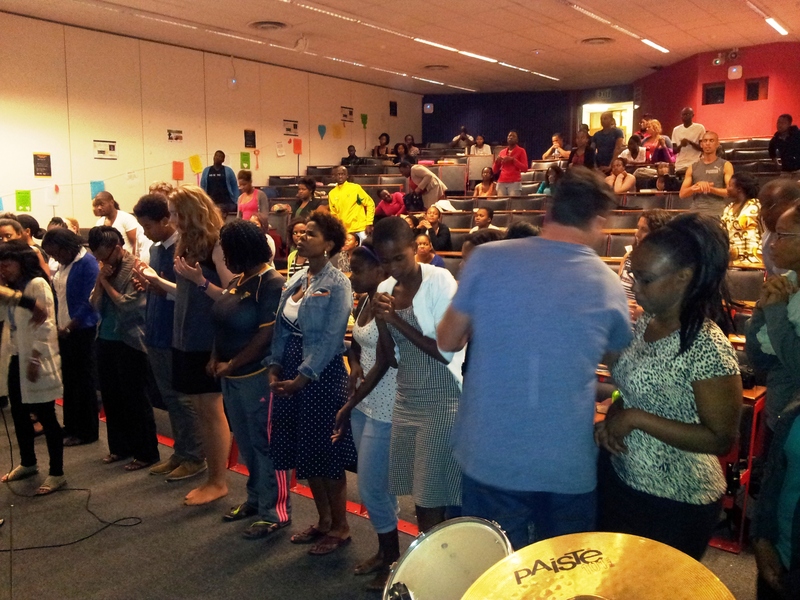 All our residences had prayer outreaches during the exam period. I enjoyed the evening with the Glen Residence team pictured here. We had invited some unsaved students to a time of prayer and exam encouragement, while a group of us stood at the entrance of the residence, offering to pray for people. It was incredible to see the students so bold and unashamed of the gospel. Many of their fellow students were so blown away that other students would be encouraging them in this stressful time. We had two young men that wanted to give their lives to God but they wanted to first spend time with our leaders to ask more questions. Please pray for these two young men over the holiday time and the times of ministry they will have with our student leaders. 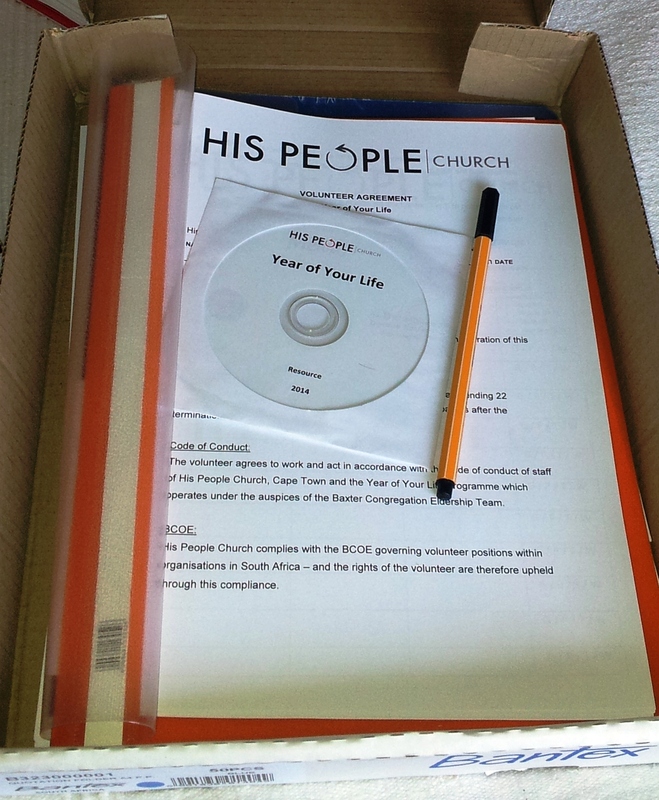 On the 19th of January, I kicked off ‘Year of Your Life 2014’ with 7 new trainees. 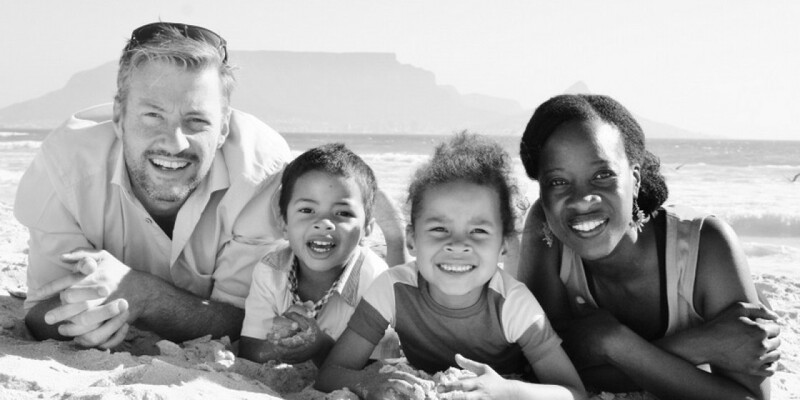 One of them is a lecturer at Cape College and she is preparing to start a ministry on that campus! I am excited about this opportunity to help prepare someone to plant a new chapter of campus ministries on a different campus this year. We started the semester off with an inspirational Mission ‘boot camp’ for all the student leaders. As always, very little sleep was had but it was full of worship, vision, prayer, strategy and lots of fun ‘hanging out’ over amazing meals provided at the camp-site. I had the privilege of speaking to and inspiring the students on the vision of Campus Ministry. It was such a wonderful way to begin the campus year, full of vision and expectation of what God can do in and through the students through their entire student lives, and beyond. There was high expectation to draw closer to God and enjoy Him, a great expectation to see other students saved, and a great expectation for academic excellence as they discover God’s plan for their lives. The Identity and Destiny conference. Following that we had a jam-packed two weeks of orientation, with every one of our connect groups working toward our mission goals: to see every student hear the gospel when they come to University. Concurrently, we ran an “Identity and Destiny” seminar, for the first time, which was for both our students and the young people we were reaching. It really was incredible for both groups of students! I remember watching one young man who had committed his life to Christ during the outreach, crying throughout the teaching sessions as God was ministering to him. For those that are Christ followers it was inspirational, and it was a time of spiritual freedom for everyone. 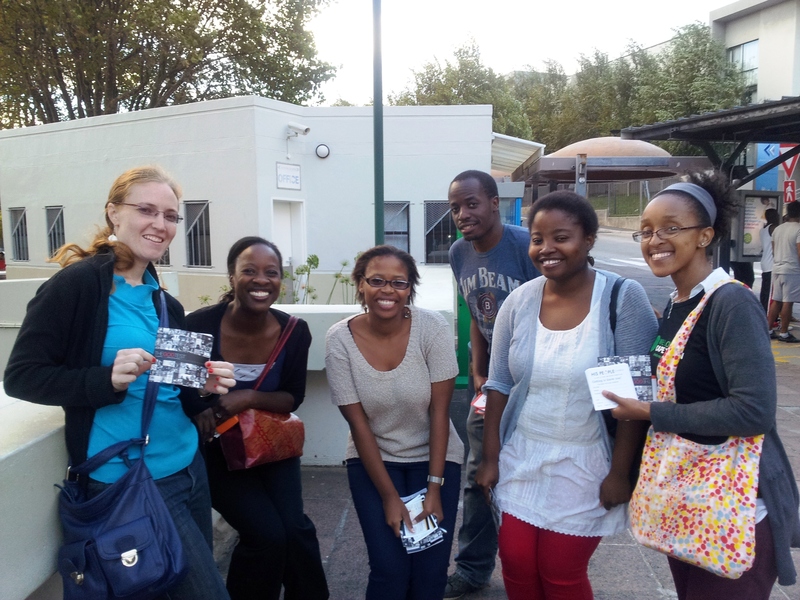 On our way to reach out in the streets of Rondebosch on a Friday night. 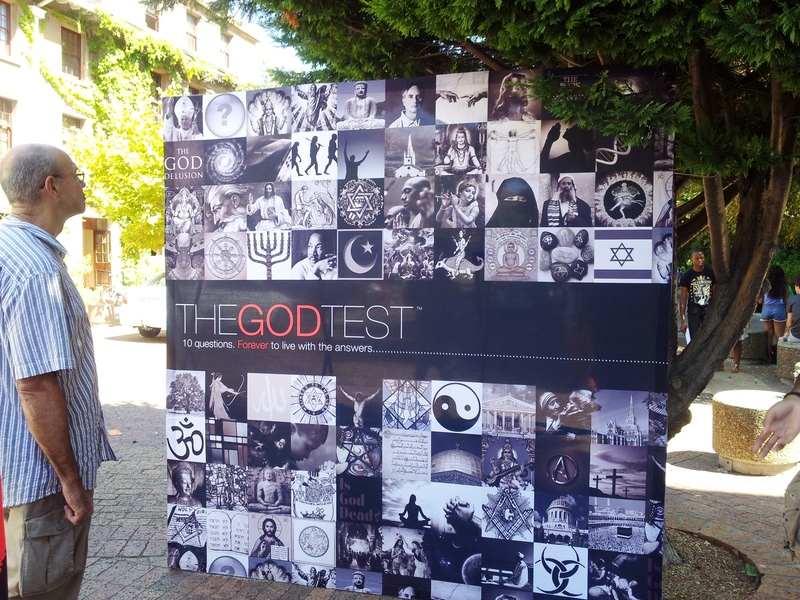 A UCT staff member checking out the ‘The God Test” banner. 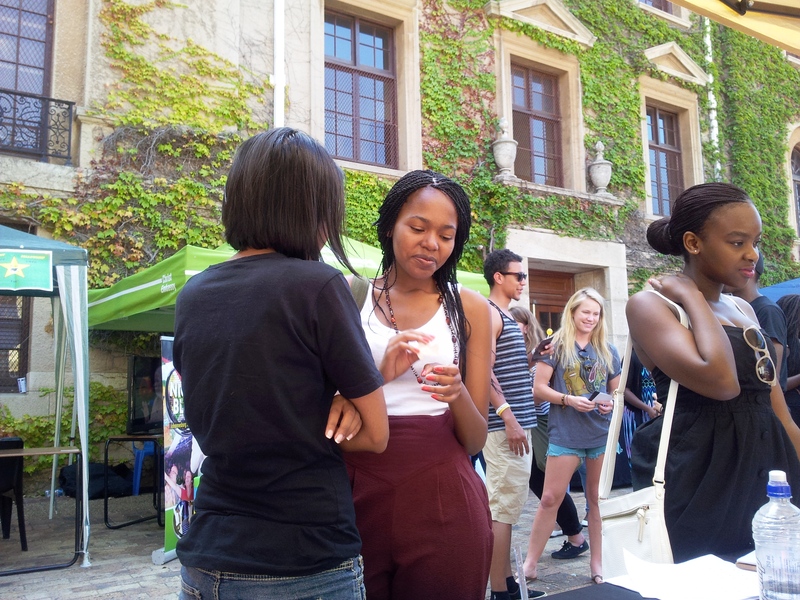 Roshni, the UCT ‘His People’ Campus ministry director, leading a student to the Lord at our ‘O’ week plaza table! 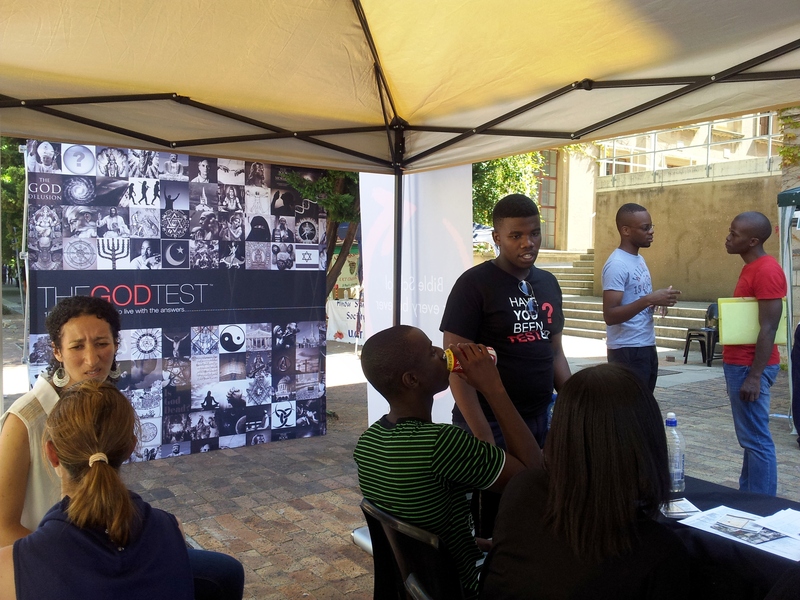 The ‘His People’ Campus Ministry plaza table 2014. The Combined Christian Societies Campus Worship evening was a wonderful time to Praise God together for what He did and will still do. It was a great time to pray over our campus in unity! After an incredible campus outreach we all got together as the leaders for 2014 to celebrate, hear and share the game plan for the semester and to minister to one another. We celebrated the many salvations and healings that occurred over the mission times, and the 200+ people who signed up to attend connect groups at the ‘connect drive’. Isn’t that incredible? Serving others is always better than being served, and washing each other’s feet was such a powerful way to begin the semester. 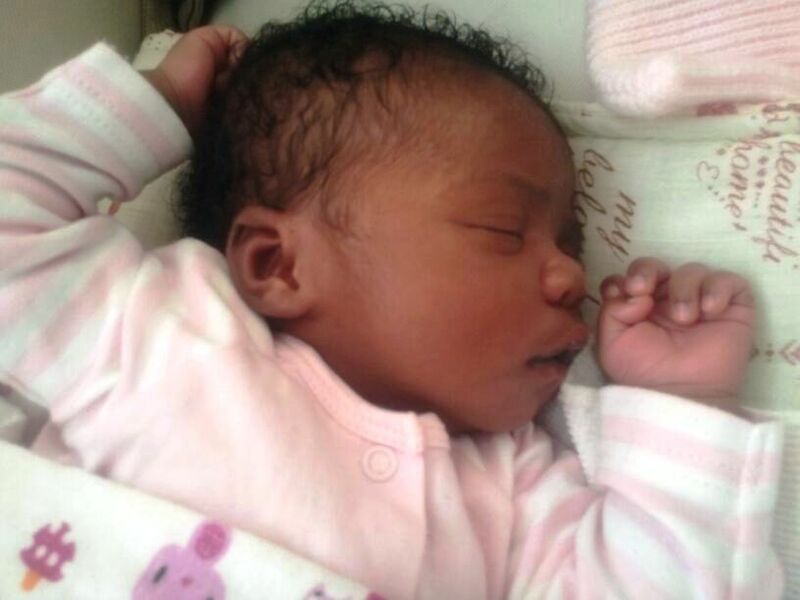 Mayah Jordan was born on the 21st of March, and she is the first baby born to either of my siblings! It is so wonderful to live so close to them and watch this little niece of ours grow! 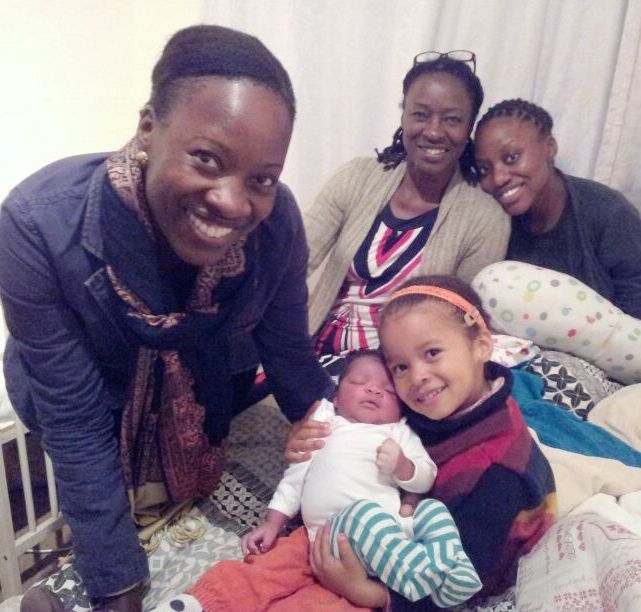 Yara and Aaronashe love their third cousin too bits, and can’t wait for her to start crawling around!